This year we made two new-to-us holiday cookies. The first was the Sparkling Coffee Stars. 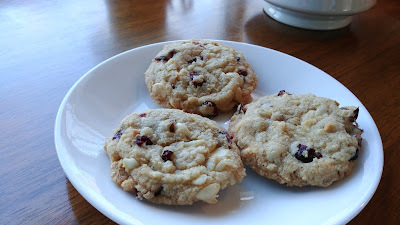 The second is these Cranberry, White Chocolate, Macadamia Nut Cookies from America's Test Kitchen. They are in The Perfect Cookie. Turns out they're also in the Christmas Cookies magazine/book that was sold back in 2012 at the holidays. These are easy to make, especially if you buy already chopped macadamia nuts (we did, we found some in Walmart) and if you have someone else chop the dried cranberries (thanks mom!). We did have a debate about whether or not we wanted to make each cookie from 2 tbsp of dough. That sounded like a huge cookie. I prefer smaller cookies for a cookie tray with lots of varieties of cookies. Otherwise, one big cookie can fill you up and then you don't have room for the other ones. We settled on just using our cookie dough scoop like we do for chocolate chip, triple ginger, etc. We watched the bake time closely, wondering if they'd need less time since they were a bit smaller. The answer for us was no. Ours baked 18-19 minutes. We also got 48 cookies instead of 32. 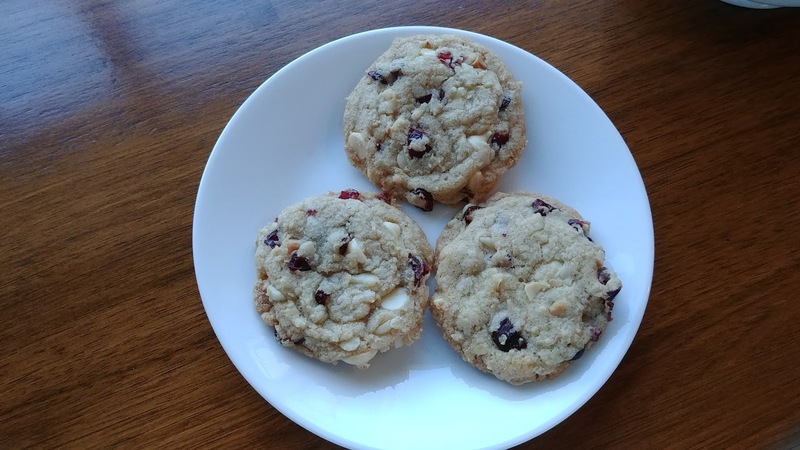 I picked these cookies because I figured SP would like cookies with dried cranberries and nuts. I like cranberries with white chocolate in a cookie. Also, the cranberries would add a festive red color to the cookie tray. 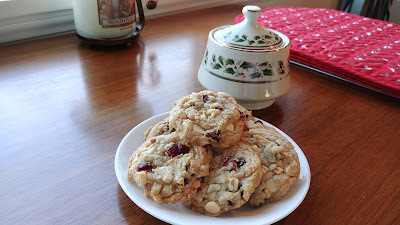 These are chock full of tasty bits in each bite (1 cup each of cranberries, chocolate, and nuts). They're soft and chewy and a little crisp around the edges. These definitely might make a repeat appearance on future holiday cookie trays.